Xebia explores and creates new frontiers. Always one step ahead of what businesses need, we turn the latest technology trends into advantages for our customers. As a mainstream frontrunner, we create new solutions and build the future with our clients. An international network of passionate technologists and pioneering craftsmen, Xebia provides the cutting-edge tools, training and consulting services that make businesses work better, smarter, and faster. We believe in the power of individuals working together with a clear focus and value the human size of things. We structure ourselves in independent practises and centres of excellence to capture the intellectual energy of our fellow Xebians. These cells grow organically based on the passion of the members. Together, they create a tight network of coherent and complementary businesses. 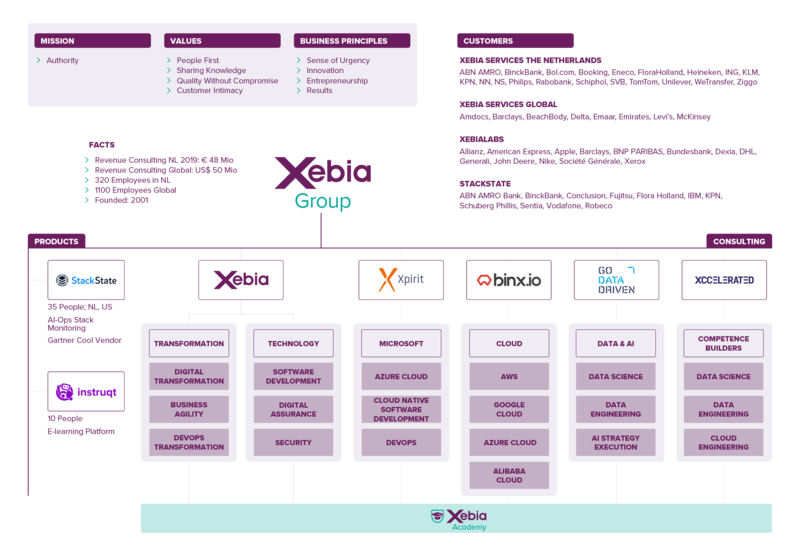 Xebia Group consists of seven specialized, interlinked companies: Xebia, Xebia Academy, StackState, GoDataDriven, Xpirit and Binx.io. With offices in Amsterdam and Hilversum (Netherlands), Paris, Delhi, Bangalore and Boston, we employ over 1000 people worldwide and generate 100 million in revenue. Our services and product solutions address digital strategy; agile transformations; DevOps and continuous delivery; big data and data science; cloud infrastructures; agile software development; quality and test automation; and agile software security. International digital consulting and transformation services. Get ready for the next era of computing with a proven authority in Cloud, Microsoft Application Lifecycle Management, and Enterprise Mobility. Our Big Data experts help you create data driven solutions that improve productivity and increase your bottom line. StackState provides immediate insight into the cause and impact of any change or failure and helps you keep everything stable, repaired and running smoothly. Professional development is a continuous learning process. Grow smarter. World class technology experts to help you move, run and innovate in the cloud. Xebia is always on the lookout for extraordinary people. We give you space and power to become your best in a community of ambitious and talented peers. Supporting the passion of exceptionally smart people is the foundation of our organization. Everything about us - our structure, values, strategic innovation, hiring process, and knowledge management - is anchored on this principle. Our Open Kitchen bi-weekly knowledge exchanges, Innovation Days, frequent tech-rallies, and TED-style conferences, all contribute to exploring and achieving our full potential, individually and collectively as Xebians. As Xebians, we learn, grow, explore and create new frontiers in business together. Xebia Group is the result.